Lip biopsy may be necessary to identify the histopathology of a visible oral lesion or to assist in the diagnosis of a systemic disorder. If a lesion is noted on the lip or oral mucosa, incisional or excisional biopsy is clinically indicated if concern for malignancy exists. Findings such as red or white discoloration, induration or fixation to deeper tissues, rapid growth, friability, or ulceration should raise concerns for malignancy. Some advocate monitoring a lesion for 2 weeks after any irritants are eliminated, to allow for any inflammatory or irritative lesions to resolve. If a lesion does not respond to this conservative management, then biopsy is indicated. Punch biopsy and scalpel biopsy may also be of assistance. 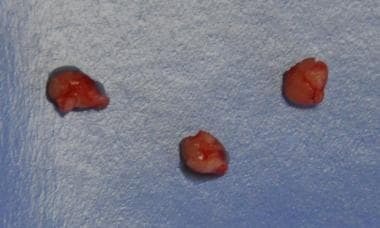 Biopsy should be performed on any oral lesion that persists despite removal of an irritative stimulus. Biopsy is indicated if mucosal lesion findings suggest malignancy (eg, erythroplakia, leukoplakia, induration or fixation to deeper tissues, rapid growth, friability, ulceration). Submucosal minor salivary gland biopsy should be done if the diagnosis of Sjögren syndrome (SS) cannot be made by history and serologic testing (eg, SS-A/Ro and SS-B/La) or if, despite testing, the diagnosis remains in question. Lip biopsy has few absolute contraindications. The decision to proceed with biopsy in the following circumstances must be individualized to the patient’s findings and the ability of the surgeon to minimize morbidity. Bleeding diathesis secondary to anticoagulation, or significant coagulopathy. However, the lip is very amenable to manual pressure and easy to access for cauterization. Biopsy of tissue overlying irradiated bone or over bone in patients on bisphosphonates. Mandibular osteonecrosis may occur in these patients. This is not typically a problem with true lip biopsies but can be with other oral cavity biopsies or if the lip biopsy extends to the gingiva. Lip biopsy for mucosal lesions or minor salivary glands is typically done under local anesthesia, using 1% or 2% lidocaine with 1:100,000 epinephrine. Procedures in children may require sedation. For more information, see Procedural Sedation. Topical anesthetic sprays are not usually sufficient for anesthesia in the case of biopsies, although some clinicians may use them prior to injection of the local anesthetic. Inject the lip at the desired biopsy location (see image below), using a 27- or 30-ga needle and a 1- to 3-mL syringe. For more information, see Nerve Block, Oral. Injection of local anesthesia into lip for biopsy. An upright sitting position is preferable. The patient may be seated in a otolaryngology or dental examination chair. A gurney or hospital bed placed in an upright position is also acceptable. Explain the procedure, indications, and risks as part of the informed consent process. Insure that adequate lighting is available. This may take the form of a head mirror, headlight, or surgical light. Anesthetize the biopsy site via infiltration of the local anesthetic. The surgeon should be familiar with the anatomy of the region (see image below). For a detailed discussion, see Medscape Reference article Lips and Perioral Region Anatomy. 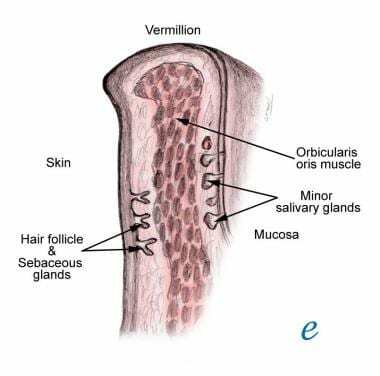 An elliptical incision is typically used to obtain an incisional or excision biopsy of a visible mucosal lesion. Orientation of the ellipse should take into account the vascular and neural structures in the area, as well as any functional or cosmetic concerns. For the lip, most elliptical incisions should parallel the long axis of the lip, to most easily allow the recommended 3:1 length:width ratio. In large resections, the vermilion of the lip may be reduced or the white roll at the vermilion junction may be retracted. Incisions perpendicular to the long axis cause less of this distortion but may require extension beyond the vermilion border or onto gingival tissue to maintain the 3:1 ratio. After allowing for hemostatic properties of 1:100,000 epinephrine in local anesthetic, incise the mucosa with 2 curvilinear lines, forming the ellipse. Delicately grasp the edge of the ellipse with fine forceps. Dissect beneath the ellipse with fine sharp scissors. The depth of dissection should be determined by the lesion characteristics. In most mucosal lesions, the plane of dissection is in the layer that contains the minor salivary glands, leaving the orbicularis oris muscle intact. Sharp skin hook retractors may be helpful, if an assistant is available. Deliver the elliptical specimen and send to the pathology laboratory in the appropriate tissue media. Obtain hemostasis via manual pressure, silver nitrate cautery, or electrocautery. Closure of the wound may be aided by circumferential undermining, depending on the size of the resultant defect. Suture the mucosa to reapproximate the edges. Suture type is based on surgeon preference, from silk to chromic gut to polyglactin. Biopsies may be performed with instruments other than a scalpel. Lasers may be used, if available, but care must be taken to include an additional rim of tissue around the lesion to compensate for tissue loss from the thermal device. Laser safety precautions for staff and patient must be used. Although immediate hemostasis is improved with the laser, the benefits may not outweigh the added issues. Cup biopsy forceps may also be used but have little advantage on the lip. They are better designed for oropharyngeal biopsy sites. Additionally, they offer the potential risk of crush artifact. Make a linear 1.5-cm incision on the lip mucosa, oriented parallel to the lip’s long axis. The lower lip is used for convenience of positioning. This incision should be placed lateral to the midline, as the minor salivary gland density is greater than on the midline. Placing the lip on stretch may allow for visualization of the submucosal minor salivary glands. See image below. Minor salivary glands seen through the mucosa. The minor salivary glands are readily identifiable by their lobular nature, superficial to the muscle. Remove several individual glands for pathologic evaluation and place them in formalin. Take care during dissection to avoid injury to nearby branches of the mental nerve. See images below. 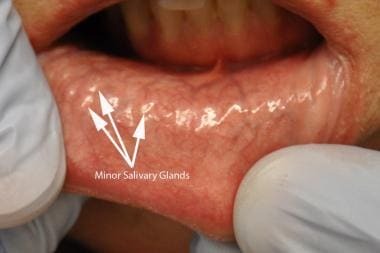 Minor salivary glands seen in situ. A branch of the mental nerve is also visible within the surgical site. Achieve hemostasis via manual pressure, silver nitrate cautery, or electrocautery. Close the incision with suture (silk, chromic gut, or polyglactin) to reapproximate the mucosal edges. See image below. Closure of lip biopsy site. A chalazion clamp may be used to fixate the lower lip mucosa, allow for manipulation of the lip during the procedure, and permit the minor salivary glands to be more easily seen through the stretched mucosa. Additionally, bleeding is minimized by use of this clamp. See image below. Chalazion clamp in position for biopsy. Some literature supports the idea that alternative sites may provide some advantages in attempting to confirm Sjögren syndrome via biopsy. Both the parotid gland  and the sublingual gland  have been considered as alternative sites with similar sensitivity and specificity and reduced morbidity. 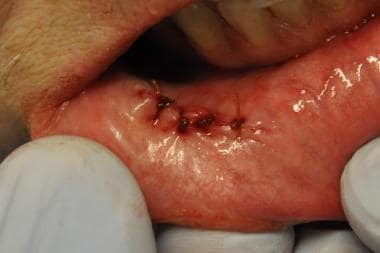 The decision to perform a biopsy on a lip lesion is based on clinical index of suspicion or lack of resolution within 2 weeks of removal of any irritants. Minor salivary gland biopsy is done transorally and should include at least 3-4 glands. Minor salivary gland biopsy may assist in making other systemic disease diagnoses, such as sarcoidosis, amyloid polyneuropathy, or neonatal hemochromatosis. Pain is usually minimal and lasts 1-2 days. Lip biopsy may not be sufficient for diagnosis. Given the sensitivity of these biopsies for Sjögren disease, additional biopsies may be needed. Some authors have recommended sublingual gland biopsy and parotid gland tail biopsies as alternatives with higher sensitivity and minimal complications. Fraioli RE, Grandis JR. Biopsy of Minor Salivary Glands of the Lip. Myers EN. Operative Otolaryngology Head and Neck Surgery. 2nd ed. Philadelphia, Pa: Saunders Elsevier; 2008. Chap 58. Ash-Bernal R, Wise R, Wright SM. Acquired methemoglobinemia: a retrospective series of 138 cases at 2 teaching hospitals. Medicine (Baltimore). 2004 Sep. 83(5):265-73. [Medline]. Ephros H. Punch Biopsy and Scalpel Biopsy. Medscape Reference. Updated June 2, 2009. [Full Text]. Greenspan JS, Daniels TE, Talal N, Sylvester RA. The histopathology of Sjögren's syndrome in labial salivary gland biopsies. Oral Surg Oral Med Oral Pathol. 1974 Feb. 37(2):217-29. [Medline]. Daniels TE. Labial salivary gland biopsy in Sjögren's syndrome. Assessment as a diagnostic criterion in 362 suspected cases. Arthritis Rheum. 1984 Feb. 27(2):147-56. [Medline]. Pijpe J, Kalk WW, van der Wal JE, et al. Parotid gland biopsy compared with labial biopsy in the diagnosis of patients with primary Sjogren's syndrome. Rheumatology (Oxford). 2007 Feb. 46(2):335-41. [Medline]. Pennec YL, Leroy JP, Jouquan J, Lelong A, Katsikis P, Youinou P. Comparison of labial and sublingual salivary gland biopsies in the diagnosis of Sjogren's syndrome. Ann Rheum Dis. 1990 Jan. 49(1):37-9. [Medline]. Berquin K, Mahy P, Weynand B, Reychler H. Accessory or sublingual salivary gland biopsy to assess systemic disease: a comparative retrospective study. Eur Arch Otorhinolaryngol. 2006 Mar. 263(3):233-6. [Medline]. Kessel A, Toubi E, Rozenbaum M, Zisman D, Sabo E, Rosner I. Sjögren's syndrome in the community: can serology replace salivary gland biopsy?. Rheumatol Int. 2006 Feb. 26(4):337-9. [Medline]. Marx RE, Hartman KS, Rethman KV. A prospective study comparing incisional labial to incisional parotid biopsies in the detection and confirmation of sarcoidosis, Sjögren's disease, sialosis and lymphoma. J Rheumatol. 1988 Apr. 15(4):621-9. [Medline]. Stewart CM, Bhattacharyya I, Berg K, et al. Labial salivary gland biopsies in Sjögren's syndrome: still the gold standard?. Oral Surg Oral Med Oral Pathol Oral Radiol Endod. 2008 Sep. 106(3):392-402. [Medline].